There are two types, one without lotus paste and the other has plain lotus paste, red bean paste and pandan flavored lotus paste. I bought a few of each type seeing they were so cute especially the two chubby piggies ! They reminded me of my two Piggies LOL! Oh...the moulds are so cute. Where did you get these moulds. i am still admiring your blog.. so neat and classy.. and of course the food!!!! 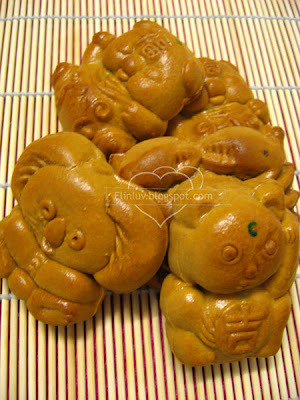 so out of the world.. how i wish i were yr neighbour.. hahaha..
the little piggies mooncakes look soooooooooooo cute! I love mooncakes. I heard there's bak kwah mooncakes also. 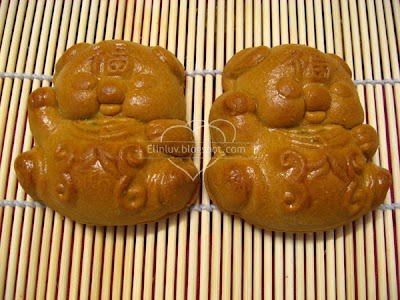 The moon cakes are so nice. 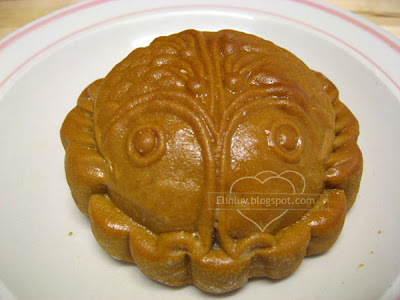 i didnt realised until recently that mooncakes can actually be homemade! hv met a couple foodies who make homemade mooncakes. u guys rock!!!! Elin, This is great! I've never heard of mooncakes before, but they look yummy! Reanaclaire, you couldn't be more right. I was just thinking how "neat and classy" this blog is... always such exquisite and nicely-ordered pictures! I don't even know what lotus paste tastes like, and here I'm convinced I'm eating it as I read! Thanks for dropping by to drool at the mooncakes. I bought them from friends and I didn't make any this year. A big thank you to Reanaclaire and MaryMoh for your kind words. 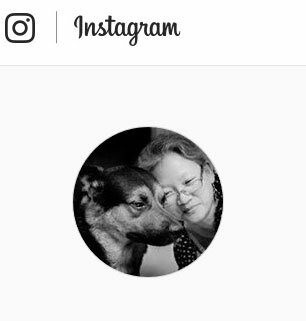 I hope to continue to post up all my bakes and dishes I cook often and share the recipes with you guys. You guys rock! Love the mold, do you know if there is a place that sells them?